Manchester United have started the new campaign in stunning fashion, and glory days seem to have returned to Old Trafford. 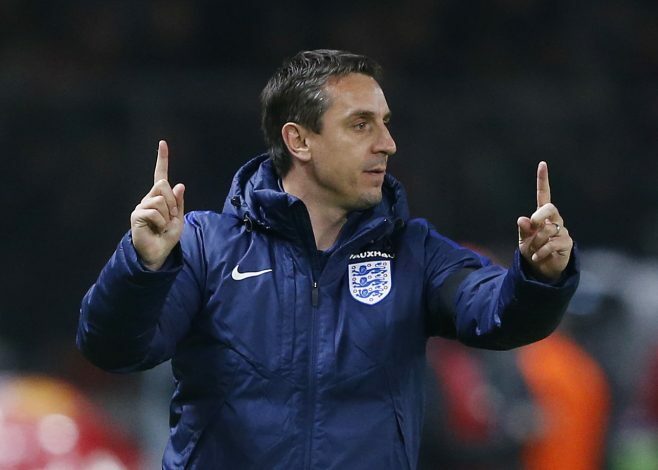 However, club legend Gary Neville believes they face a threat of instability at left-back. Last week, the Red Devils paid a visit to the Bet365 Stadium; a fixture they have failed to win since 2013. Though that might’ve been something they would’ve wished to change, the match ended as a 2-2 draw. However, regardless of the shared points, Jose Mourinho’s side might feel intimidated going forward in the season, as Stoke City were seen exploiting their left-back area, which could clearly be seen when Jean-Eric Choupo-Moting scored the opener. Meanwhile, this issue hasn’t gotten past Neville, who further reinforced his point after United’s fixture against Everton, where Ashley Young almost looked aimless on the left flanks. “I think the problem is on the other side at left-back, where Ashley Young was put under a lot of pressure by [Tom] Davies and [Cuco] Martina,” said the decorated full-back whilst speaking on Sky Sports. Mourinho has been in search of the perfect player to fill in the void at left-back, but has failed to find one so far. Though Matteo Darmian, Daley Blind and Luke Shaw are prime candidates to take up the role, we have seen the former two, as well as Young playing there so far this season. Though the Premier League giants lead the race for the title alongside local rivals Manchester City as of now, their title challenge could be awaiting a defensive crisis unless a change is made soon.